It was during the Man City match earlier in the season when Liverpool fans’ initial anxiety over Roy Hodgson’s appointment first seemed justified. The then-faces of Sky, Andy Gray and Richard Keys, gushed over Liverpool finally doing what they wanted and acquiring a nice 4-4-2-playing English manager who would play Steven Gerrard in his proper place in central midfield, before showing the merits of man-to-man marking over zonal, getting nice and touch-tight. Then, predictably, Liverpool got mauled 3:0 by a dominant City side with the fancy Dan scarf-wearing foreigner coach. Several months later, Liverpool returned the favour and did so with much of that losing side’s set-up still intact. Funny old game, eh? 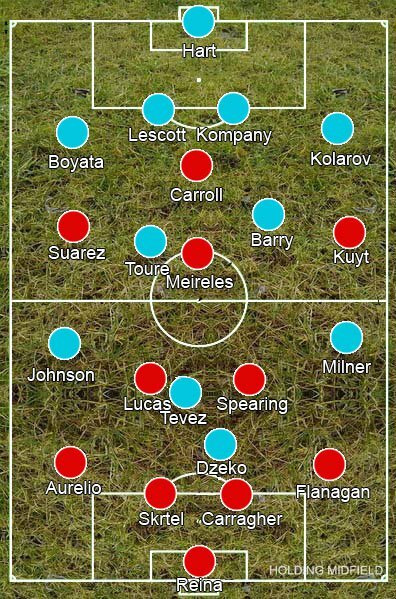 Liverpool started the game in something resembling a 4-2-3-1, while Roberto Mancini set up in either a 4-4-2 or a 4-2-3-1 depending on whether you view Carlos Tevez’s role as a forward or midfielder. The game started quietly; both sides trying to get a feel for the other. There was little to note tactically, except for the struggles of Yaya Toure. For the majority of his time at City, he’s been played in an attacking midfield role and he was often pushing on very high before melancholically trotting back towards his proper position – at times he was pushing so high I began questioning where he was meant to be playing. It could be the formation of Liverpool meant he was having to pick the opposition holding midfielder high up the pitch, but it looked more likely he simply wasn’t entirely sure how to play the role. With Toure pushing higher, Gareth Barry was left to man the midfield alone and there was space for the left-sided Luis Suarez to drift into; it was this early exposure of Barry that led to Liverpool gaining control of the match. Just as they started to dominate, Liverpool switched to a 4-4-2 formation, with Raul Meireles moving left and Suarez partnering Andy Carroll up front. The timing would suggest otherwise, but it didn’t seem to effect the game too much – what it did allow for, however, was more movement from Carroll. Beforehand, he had been quite stationary but now he was drifting to the left or deeper, which was beneficial for him because it meant he was fitting into the team rather than just playing to his main strength, and ultimately led to the first goal. The injury to Tevez meant City were forced to reshuffle too: on came Mario Balotelli to go left, while James Milner moved to the centre to play the most attacking midfield role in the 4-3-3/4-2-1-3 they switched to, which gave more support for Barry when defending. Although Milner generally looks a bit off in the centre, he does make some interesting movements towards the wings, which he did last night but often he probably should have tried running beyond Fabio Aurelio to give Adam Johnson or Dedryck Boyata a more direct option and open up some space in the centre – as it was all he was doing was letting Lucas or Jay Spearing play catch up. Earlier in the season, Milan Jovanovic and Dirk Kuyt came inside looking for the ball, resembling a 4-2-2-2. Last night, Meireles and Kuyt were willing to do the same, and there was some quite obvious differences. The shorter passing and pressing is the main difference between the Hodgson and Dalglish eras, and it doesn’t really need explaining why a side suited to the latter’s style is performing better. In the second half, Liverpool reverted to a deeper and more narrow style. It was more Rafa Benitez than Roy Hodgson though – with a three goal lead, the emphasis was on City to attack. Liverpool’s organisation was top notch – compacting the space expertly, with only Aleksandr Kolarov looking any good from out wide. When they sensed City were struggling they pounced, often surprising players with bursts of pressing. They counter-attacked effectively too and it helped they now had a big man up front to aim for, rather than hoofing it upfield hopelessly. As seen in the third goal, Carroll gives Liverpool a new angle – although Fernando Torres was decent in the air, he wasn’t the target man Hodgson was attempting to mould him into. Carroll, on the other hand, is. A long pass up to him was an excellent way of quickly switching the play for a counter-attack – there’s few better ways to stretch a pitch than a long ball after all. It helped Liverpool had some discipline in the side though. Although he had a mediocre game on the ball, Lucas was as sharp as ever off it and Jay Spearing gives the midfield the pure energy missing since Javier Mascherano’s departure, while Kuyt proved how valuable his clever mind and remarkable stamina can be when in a side that can use it. With little chance of moving up or down the table, the absence of both Steven Gerrard’s incredible talent and his lack of a footballing brain has removed a headache-inducing problem for Dalglish that resulted in defeat last time against City. Mancini brought on David Silva in an attempt to bring some creativity to City, but, although he looked brighter than most, he appeared on a different wave length to the rest of his teammates. The substitution of Balotelli for Nigel De Jong was a signal of the Italian admitting defeat. However, to be perfectly honest, the majority of this article is just unnecessary detail. There were no major tactical victory on show, Liverpool were simply much better than a remarkably awkward and tired-looking City side, and for that they should be grateful: unlike earlier in the season, they now have a manager who can get his basic tactics right. If you equal the opposition tactically, it’s then left up to ability. As for City, it’s hard to see what else Mancini could have done – the tactical switches he made seemed logical, but the major issue seemed to be his players. That’s still his problem of course, but, unless his players have problems with him, he shouldn’t be blamed for the most part, despite what he said post-match. I wonder how it would have went if they had Dejong in the side. Dzeko didn’t offer the team much, and Tevez was doing quite well being a single target man. This is a wonderful victory, but Liverpool is so inconsistent these days, I doubt they can carry the form on to next week.